The Bridgeport, CT Police Department has activated the New York State AMBER Alert and is investigating a child abduction that occurred on Greenwood St, in Bridgeport, CT at about 3:30 AM on 2/24/2017. 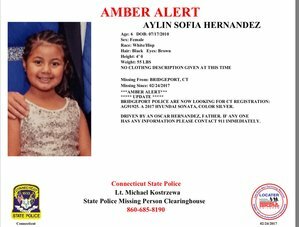 The CHILD, Aylin Sofia Hernandez is a Hispanic female, approximately 6 years old with black hair and brown eyes. She is approximately 4 feet 0 inches and weighs about 55 pounds. Aylin was last seen wearing unknown clothing. The SUSPECT, Oscar Hernandez is a Hispanic male, approximately 39 years old with short, brown hair and brown eyes. He is approximately 5 feet 3 inches tall and weighs about 185 pounds. The VEHICLE has been identified as a Grey 4-door sedan Hyundai Sonata with Connecticut license plate number AG91925. The SUSPECT was last seen traveling on Jennings Street in Bronx New York possibly heading for Bronx locations. Suspect abducted child after committing a homicide in Bridgeport Connecticut. Suspect is believed to be in the New York City area. Anyone with any information on this abduction is asked to call the Bridgeport, CT Police Department at (866)N Y S-AMBER or dial 911 to provide information on a report or sighting. Visit http://amber.ny.gov for the most up to date information concerning this alert.